If you use a Rental license, you must submit a license usage report to Veeam every month. 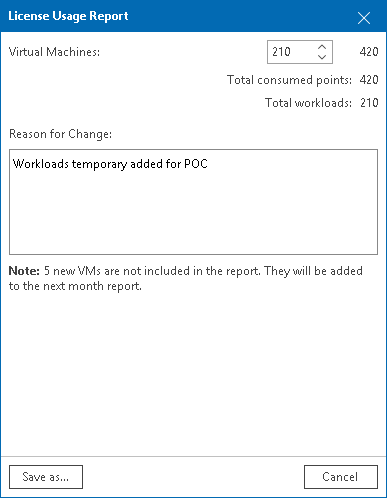 The license usage report reflects the maximum number of instances consumed by VMs and Veeam Agents (Workstation and Server) that you were managing with Veeam ONE within the previous calendar month. You can submit a license usage report in Veeam ONE Monitor (recommended). For details, see Submitting License Usage Report in Veeam ONE Monitor. You can submit a license usage report manually by sending an email with a generated report to a Veeam sales representative. For details, see Submitting Offline License Usage Report. If Veeam ONE server has access to Internet, you can submit a license usage report in Veeam ONE Monitor. When you submit a license usage report in Veeam ONE Monitor, Veeam ONE sends license usage statistics to the Veeam License Update Server. This method is available only if license auto update is enabled. For details on automated license update, see Updating License. 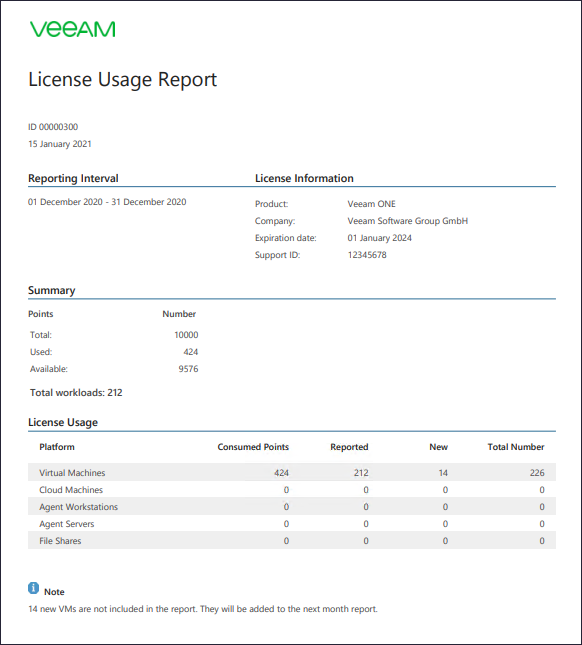 Veeam ONE collects statistics on the current license usage. 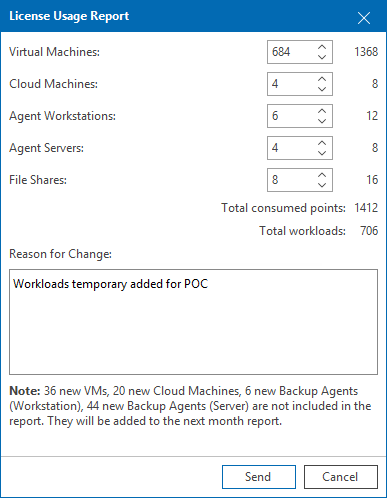 On the first day of the new month, Veeam ONE generates a license usage report based on the maximum number of managed objects in the previous month. Veeam ONE informs you about the generated report with a notification window in Veeam ONE Monitor each time you access the console. You can review the report, adjust it and send it to Veeam. If you do not send and save the report, on the eleventh day of the month, Veeam ONE will save and send the report automatically. You can access the report on the Veeam ONE server, in the %ProgramData%\Veeam\Licensing\Veeam ONE Report folder. In the License Information window, click Send Statistics. In the License Usage Report window, you can adjust the number of managed VMs and Veeam Agents before you submit the report. In the Reason for Change field, specify a reason for changing report statistics or any additional information. Veeam ONE will display a dialog box with the submission result. If Veeam ONE server does not have access to Internet or has connection problems, you can submit an offline license usage report. When you submit an offline license usage report, Veeam ONE generates a file with license usage statistics. The report file can be generated in the JSON, PDF or XLS format. You must send a report in the JSON format to Veeam. You can save the report in the PDF or XLS formats for your own needs. This method is available only if license auto update is disabled. For details, see Updating License. Click Save as and choose a folder to which you want to save the report. When the report is generated, Veeam ONE will display a dialog box notifying that the report was created. In the dialog box, click Open folder to navigate to the folder where the report resides. Review the report and send it to a Veeam sales representative. The following image illustrates a sample of a license usage report.